Before you can effectively interpret laboratory analysis of forage, you need to have a basic understanding of plant cell structure and components. 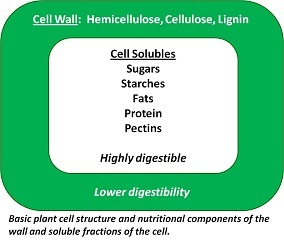 The soluble components of the plant are contained within the boundaries of the cell wall and include sugars, starches, fats, protein, and pectin (see diagram), all of which are easily digested. Leaves contain more cell solubles than stems. In comparison, the cell wall contains structural components, which provide rigidity to the plant and are generally highest in the stem. These components, hemicellulose, cellulose, and lignin, referred to collectively as fiber, are not as digestible as the cell solubles. As a plant matures, the cell wall becomes more prevalent. For more accurate analyses, forages should be sent to laboratories that are certified by the National Forage Testing Association (NFTA). These laboratories have proven abilities to produce accurate test results using established reference methods.  A list of these laboratories can be found by searching the internet. A typical forage analysis will determine dry matter, crude protein (CP), and fiber, which includes neutral detergent fiber (NDF) and acid detergent fiber (ADF). Other calculated values, such as total digestible nutrients (TDF) or relative feed value (RFV), may also be included. Dry matter (DM) is the weight of the forage after moisture has been removed. Laboratories usually report nutrient compositions on a DM-basis, which removes the dilution effect of water and simplifies ration balancing, especially if ingredients vary widely in moisture content. An animal will eat enough forage to satisfy its DM needs, thus, intake increases with increasing moisture content. Crude protein (CP) is a mixture of true protein, which contains essential amino acids, and non-protein nitrogen. Crude protein is the nitrogen content of the forage multiplied by a factor of 6.25. Forage quality is partially dependent on CP level, but using this number alone for assessing quality can be misleading. Other analyses, such as neutral detergent fiber and acid detergent fiber, should also be used to appraise forage quality. The fiber content of a forage is related to the composition of the plant cell wall (see diagram) and can be broken down into the neutral detergent fiber (NDF) component, which includes hemicellulose, cellulose, and lignin, and the acid detergent fiber (ADF) fraction, which contains cellulose and lignin. Higher levels of NDF reduces voluntary feed intake of forage while higher concentrations of ADF decreases total forage digestibility. Therefore, knowing the composition of NDF and ADF in your forage will significantly aid in evaluating quality. Total digestible nutrients (TDN) and relative feed value (RFV) may also be included on your forage analysis report. Both TDN and RFV are values that are calculated from the nutrient analyses. TDN estimates the proportion of forage that can be utilized while RFV is an index that combines estimates of digestibility and intake. In summary, an excellent hay usually smells great and is bright green in color, but the most effective method to assess forage quality is to have the hay analyzed by a NFTA certified laboratory.